Arizona, 1873. The small desert town of Absolution is a close-knit yet uptight community where strangers aren't welcome. The streets are harshly run by iron-fisted Colonel Dolarhyde (Harrison Ford). But when a stranger (Daniel Craig) with no recollection of who he is or where he has come from stumbles into town, Dolarhyde's power is put to a test. The only clue to this drifter's past is a mysterious shackle attached to his wrist. Soon after wandering into town the Stranger is captured and held under strict surveillance by Colonel Dolarhyde. But when a space craft lands in Absolution, the town soon comes to the realisation that this lone ranger may be their only hope in the fight to survive this alien invasion. 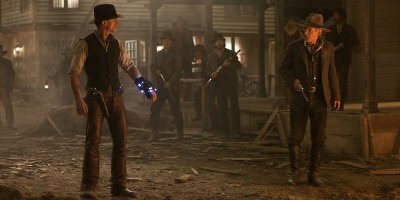 Cowboys and Aliens is well worth watching, and is a good addition to anybodies DVD library. 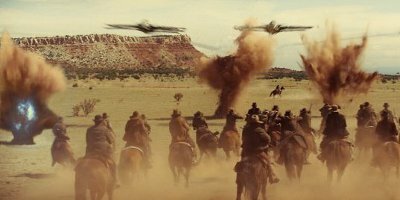 Cowboys and Aliens is a good film. It's a bit farfetched, but provided good entertainment. I really enjoyed Cowboys and Aliens. I thought it was a good take on the old Cowboys and Indians theme. When my boyfriend spoke about watching this film, I wasn't thrilled as I didn't think that cowboys and aliens in 1 film would be any good. But I have to say I really enjoyed it! There was a great storyline, the graphics were good, and I don't know how, but they made it a film you can watch more than once! I've now watched it twice and I'm sure I will be watching it again. Well worth buying. As good as was expected. Well worth a watch. Good cast, plenty of action, appealed to 18yr old and 73yr old and several ages between! Good cowboy wore black hat and the aliens were really nasty. This is a film I was really looking forward to. It had a decent cast, was directed by Jon Favreau and had a budget. What could possibly go wrong?? Unfortunately all the negative comments I heard about it were true. It's a poor film and this is from someone who'd watch any kind of junk. Special effects are fine but the story is just dreadful and the direction, I hate to say it, is very poor. The flow of the film breaks down a number of times leaving you with the feeling that you really should be doing something better with your time. The only positive is Olivia Wilde...cute as a button.